Why Shouldn't I Feed Honey to a Child Under Six? The danger of feeding honey to children is cause for concern for many parents. You should not give infants and children under 1 year of age honey, or baby cereals containing honey, because of the danger of infant botulism. This also applies to honey on soothers. However, children 2 years and older develop helpful bacteria in their intestines, which act as a defense against the harmful spores that can cause infant botulism. Honey is safe for these older children and can actually be more effective than cough syrups to help ease symptoms of a cold. Bees make honey from the nectar or secretions of living plants. More than 300 varieties of honey in the Unites States are graded primarily by color, and all contain a complex of naturally flavored sugars and traces of enzymes, vitamins, minerals and amino acids. Many baked goods or processed foods that children eat use honey for sweetener, such as honey graham crackers. Honey contains many healthy nutrients for children over 1 year of age. With 64 calories per tbsp., honey provides 17 g of carbohydrates, comprised of sucrose, glucose, maltose and galactose. A good source of potassium, honey contains 11 mg per tbsp. in addition to 1 mg of calcium, 1 mg of phosphorus and the minerals iron, zinc, manganese, fluoride and selenium. Honey provides .1 mg of vitamin C and B vitamins riboflavin, pantothenic acid, niacin and vitamin B-6, according to United States Department of Agriculture Nutrient Database. About 70 to 90 cases of infant botulism are reported each year in the United States, according to Health Canada. Infant botulism is caused by food poisoning from bacteria that thrive in soil and dust, which often contaminates honey. Bacteria spores can grow and multiply in a baby's intestines, making a toxin that may cause muscle weakness or a loss of head control, a weak cry, difficulty sucking or feeding, constipation and floppy movements. Infant botulism in children more than 12 months of age is possible, but very rare. It only takes a small number of spores to cause infant botulism in a baby; this applies to pasteurized as well as unpasteurized honey. Pasteurizing honey prolongs shelf life but does not kill the spores that cause botulism. If your baby has symptoms including difficulty swallowing, lack of bowel movement or general weakness in the arms, legs or neck, contact your doctor. Hospitalization is usually necessary for a few days or even weeks. Although antibiotics are not usually administered, according to Health Canada, an antitoxin treatment called BabyBIG is available in the United States. Although honey is not safe for children under 1 year of age, honey may be useful for reducing symptoms of coughing in children ages 2 and older. 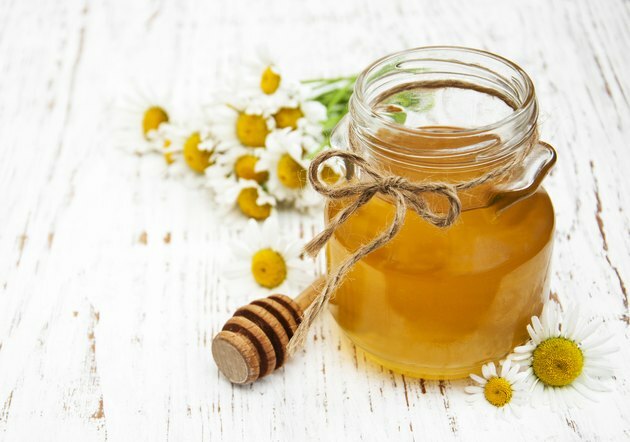 A study at the University of Calabar Teaching Hospital in Nigeria, involving 108 children over 2 years of age with upper respiratory tract infections, found honey was more effective than no treatment for reducing the frequency of bothersome coughing and sleep quality but did not make a significant improvement in resolving the severity of the cough. National Honey Board: What is Honey? Is Honey & Lemon Good for Bronchitis? What Are the Causes of Shortness of Breath in Children?